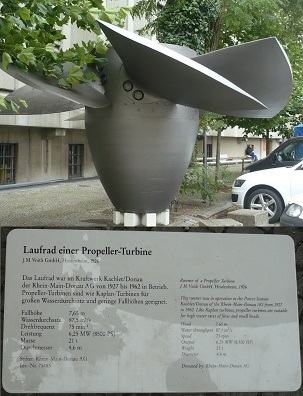 The Kaplan turbine is the most suitable type for low-head and medium-head installations where large variations of flow and head are encountered. 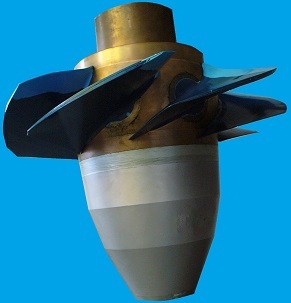 The distinguishing feature of the Kaplan turbine is the automatic adjustment of the angle or pitch of the runner blades as water flow or power output varies. The runner blades, projecting from and supported in the hub of the runner, move simultaneously during a change of load. The runner blades are rotated on their trunnions by levers, links and crosshead, or by some other suitable mechanical linkage, operated by the vertical motion of a servomotor piston rod. 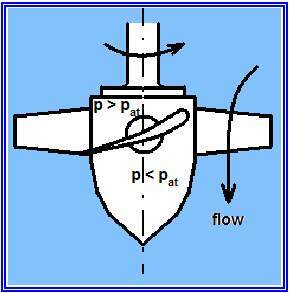 A propeller turbine has a similar design, but it has fixed blades (see the picture blow). The blades adopt automatically the most efficient position for the power output of the turbine. Also, the angle of the blades may be adjusted automatically for head variations by adjusting the cams which determine the relative movement of (and the relationship between) the wicket gates of the turbine and the blades of the runner. Besides the features already mentioned, a Kaplan turbine is equipped with an oil head and with vertical, rotating oil pipes housed within the shaft of the generator and turbine. The oil head conveys the oil from the stationary governor oil pipes to the rotating pipes which lead to the runner blade servomotor. Where turbines will be required to operate at part-load efficiency is particularly important, Kaplan turbines are installed. This requirement is most often encountered in run-of-river plants with limited storage facilities. The Kaplan turbine also allows the runner blades to be opened to a greater angle during periods of high flow and low head, giving higher power outputs during those periods than could be had from a fixed blade turbine of the same size and rated output.